There's 3 different designs to look for , in my a opinion all 3 are super cute , the yellow Pokemon pikachu sure to brighten up this summer and beat your thirst. 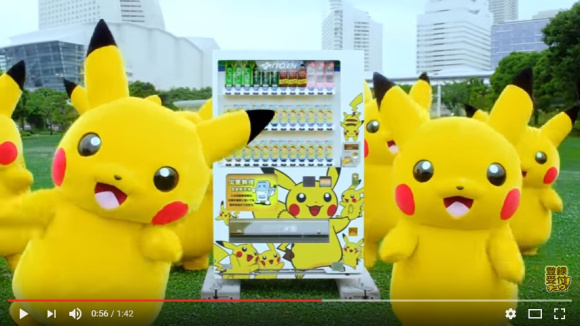 Those life size dancing pikachus are already hyped before the release of the vending machine. These vending machine are limited versions of Ito En’s vegetable juice Jyuujitsu Yasai (充実野菜). Cute simple design on the bottle not sure why Pokemon and veges juice , i would of been more happy with fruit juice. 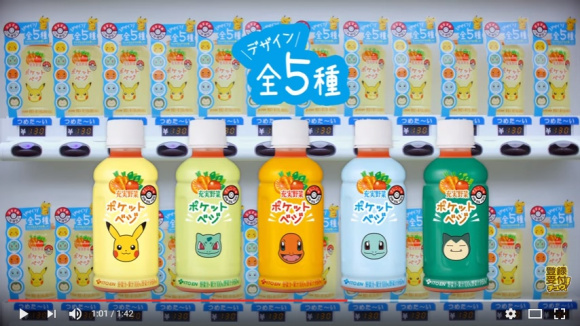 Japan McDonald's did release the pikachu banana chocolate Mc Furry and they did release the some other Pokemon images but other than the pikachu the other flavors didn't get release i guess this Ito En's veges juice will fit the craving of Pokemon themed vegetable foods/drinks (much like that bulbsaur broccoli flavor). But i hope there will be more Pokemon related goods or events getting announced because you can never get enough Pokemon especially the all time favorite Pikachu. But if there is i am sure to write about it so stay tuned!!!! So just like playing Pokemon go but instead of catching Pokemon , why don't you explore japan and go find and get yourself a cute PokeVege drink. The Pokemon Center is a store specializing in Pokemon goods and the wide range of original Pokemon goods are the most popular items at Pokemon Center. Japan is a super-convenient country - and you only have to look at things like convenience stores and vending machines being so prolific to get a taste of that.